The archive of the Extramural School of Medicine has now been catalogued as part of our Wellcome- supported project, and the collection, for the most part, is available to researchers. The multi-level catalogue is available on the Archives Hub and our online catalogue. The Extramural School of Medicine of the Royal Colleges (1895-1948) was a body consisting of lecturers recognised by the Royal College of Physicians of Edinburgh and the Royal College of Surgeons of Edinburgh, with its remit to assist in the provision of extra academical instruction in all branches of medicine and surgery. 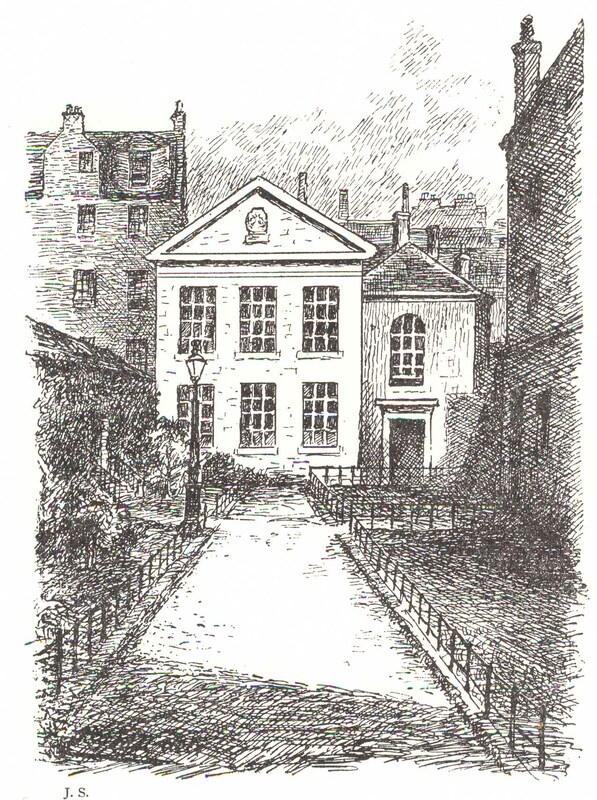 The School effectively consolidated and formalised the ad hoc arrangements for extramural medical education in Edinburgh; from the late eighteenth century extramural teaching activity flourished, with a considerable number of lecturers and private anatomy schools operating throughout the city by the nineteenth century. Traditionally, anatomy and surgery had been the subjects taught in the extra-mural environment but a wider field was provided by physiology, microscopic anatomy, chemistry, medical jurisprudence, diseases of the eye, the history of medicine, gynaecology, midwifery, mental diseases, tropical diseases, ear, nose and throat diseases, histology, pathology, and the diseases of children. Notable lecturers associated with early extramural teaching in the eighteenth and nineteenth centuries included John Bell, Joseph Bell, John Barclay, William Cullen, Daniel Rutherford Haldane, Peter Handyside, Henry Duncan Littlejohn, John Lizars, Robert Knox (Knox’s anatomy classes were regarded as the largest ever held in Britain), Noel Paton, Grainger Stewart and Patrick Heron Watson. From the late nineteenth century, a number of extramural lecturers throughout the city came together and formed the Association of Lecturers. In 1894 a Petition for a Charter was addressed to the Queen for formal recognition of a School of Medicine. This trend towards greater unity came to fruition in 1895 with the opening of the School of Medicine of the Royal Colleges. Thereafter, intramural and extramural medical teaching in Edinburgh continued to develop side-by-side, and while lecturers were at times considered rivals (before and after 1895) and sometimes involved in quite open dispute, this nevertheless gave rise to a healthy, albeit competitive, medical teaching marketplace. From the School’s inception, the lecturers were made up from those whom either of the Royal Colleges (or conjointly) recognised and granted licenses to teach either qualifying or non-qualifying subjects of medical study. Interestingly, a number of women were appointed as lecturers at the School of Medicine, teaching both male and female students. Supervision of the School was placed in the hands of the Governing Board (representing both Royal Colleges) who determined the general policy of the School. The first Governing Board, chaired by Alexander Russell Simpson included, amongst others, John Duncan, Henry Harvey Littlejohn, David Berry Hart, Noel Paton, and Patrick Heron Watson. The general business of the School was managed by the lecturers (Board of Management), the Business Committee and Education Committee. 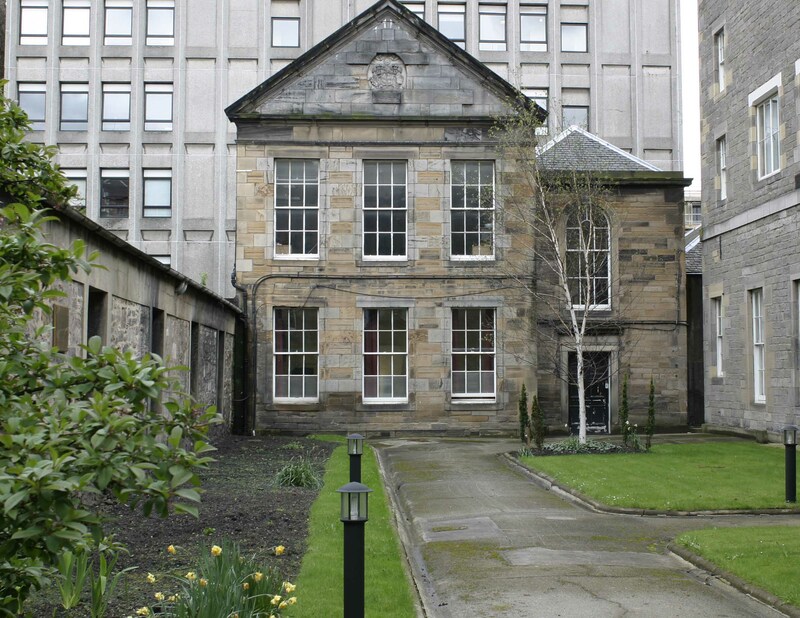 The School’s administrative base was at Surgeons’ Hall, however classes were offered at a number of locations, including, Minto House, Forrest Road, New School (Bristo Street), Nicolson Square, Surgeon Square and also Surgeons’ Hall itself. 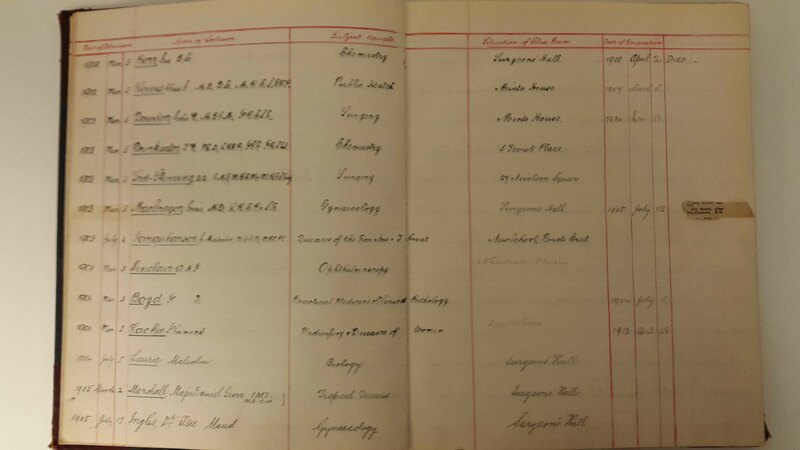 Clinical teaching was also provided at various institutions including the Royal Infirmary of Edinburgh, Leith Hospital, New Town Dispensary and the Sick Children’s Hospital. Dental instruction was offered at the Incorporated Dental Hospital and School. The School of Medicine’s doors were open to male and female students -who for varied reasons did not attend university- to train and qualify in medical and surgical practice. This was normally achieved by following a course of study leading to the Triple Qualification (an alternative to the academic MD), which was offered by the two Edinburgh Royal Colleges and also the Royal Faculty of Physicians and Surgeons of Glasgow. Students from the University of Edinburgh also attended extramural lectures provided by the School to complement and enhance their learning. This was advantageous to many students; classes at the University were often noted by contemporaries (and historians since) as being less than adequate by comparison to those offered by the School of Medicine. The School of Medicine was particularly accessible to students drawn from marginal groups or those facing educational barriers, such as women. This liberal policy undoubtedly contributed towards the success of the Extramural School of Medicine. 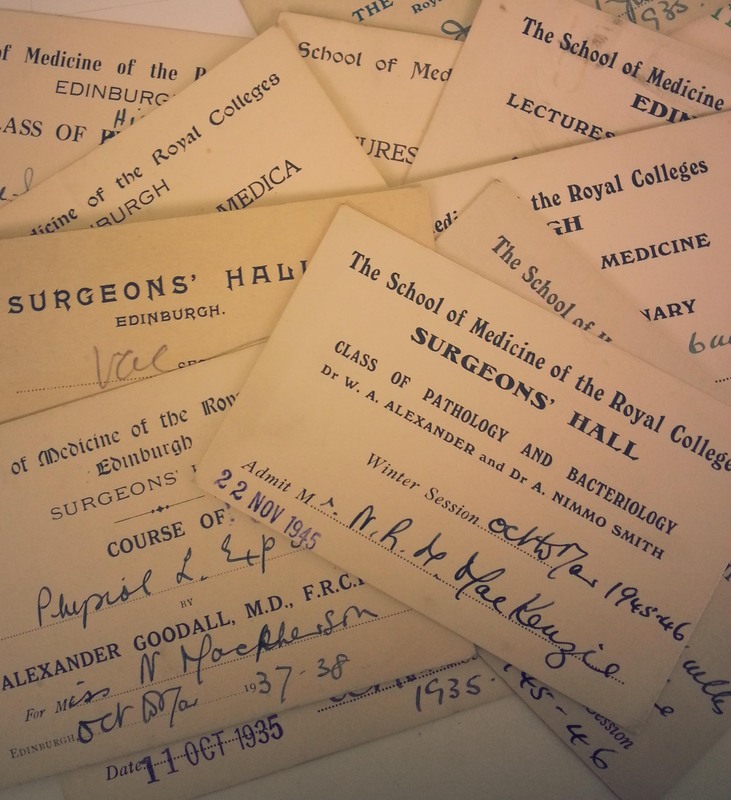 The archive is comprehensive in its coverage of nearly all aspects of governance, teaching and administration at the School, and there is also considerable material concerning relations between the Royal Colleges and the University of Edinburgh. The inclusion of the annual School of Medicine Calendars add invaluable context, in addition to the volumous correspondence sequence from the Dean’s Office. 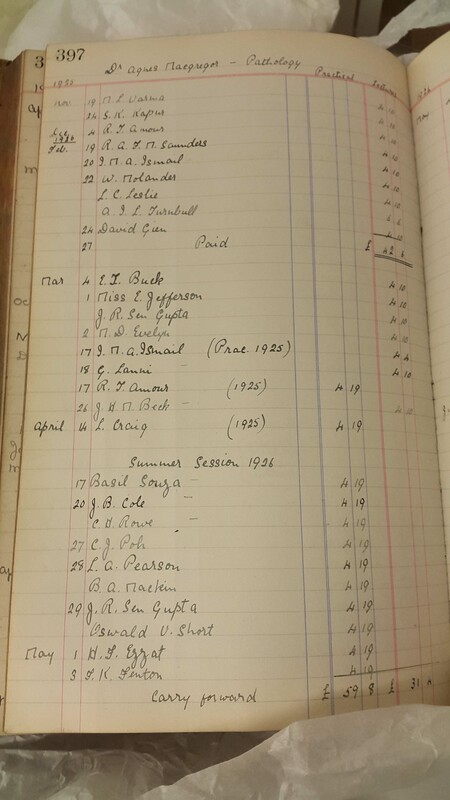 Financial aspects of the School are particularly well represented in ledgers and related accounts papers, as are records relating to lecturers, their fees and classes held by them. 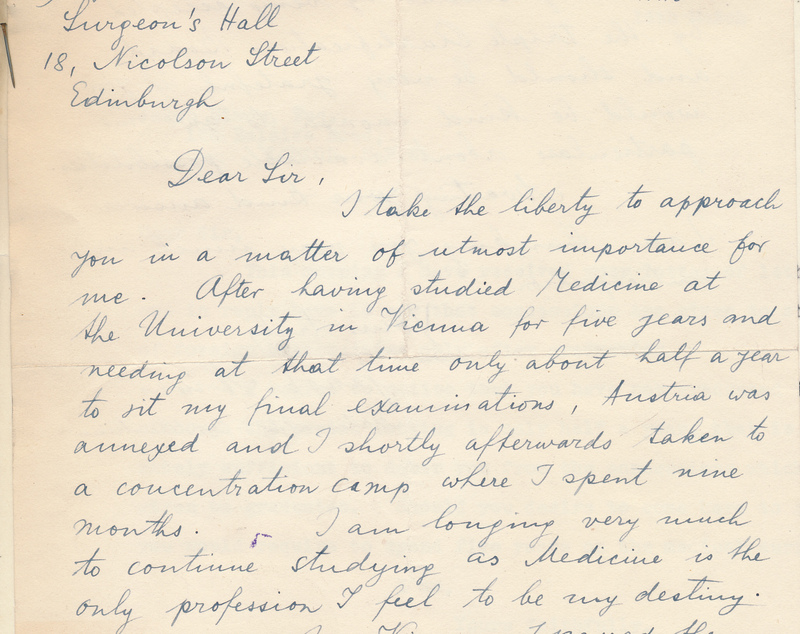 The section of the collection relating to students is especially rich for revealing how the School of Medicine acted as a magnet for students from overseas, including those evading political and religious exclusion or persecution, such as Nazi Germany. A particular highlight is the inclusion of over 1000 student files. 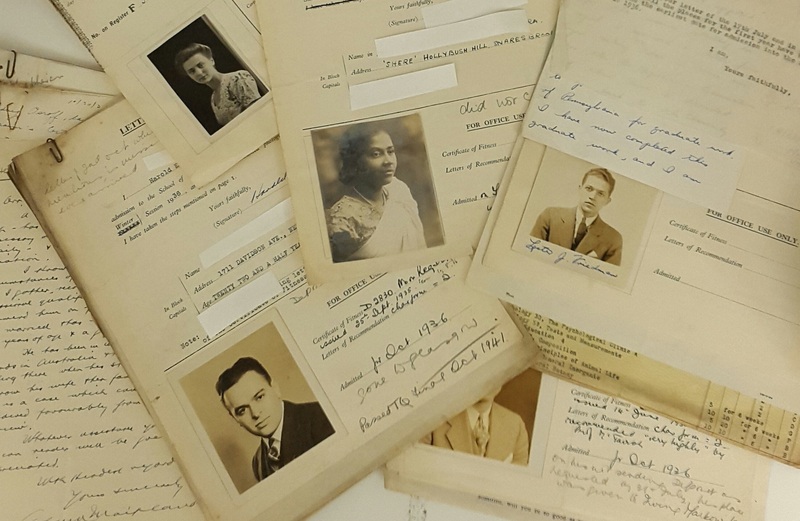 Most individual files contain application forms with portrait photographs, letters of recommendation, candidate examination records and background correspondence (look out for a future blog post on these!). 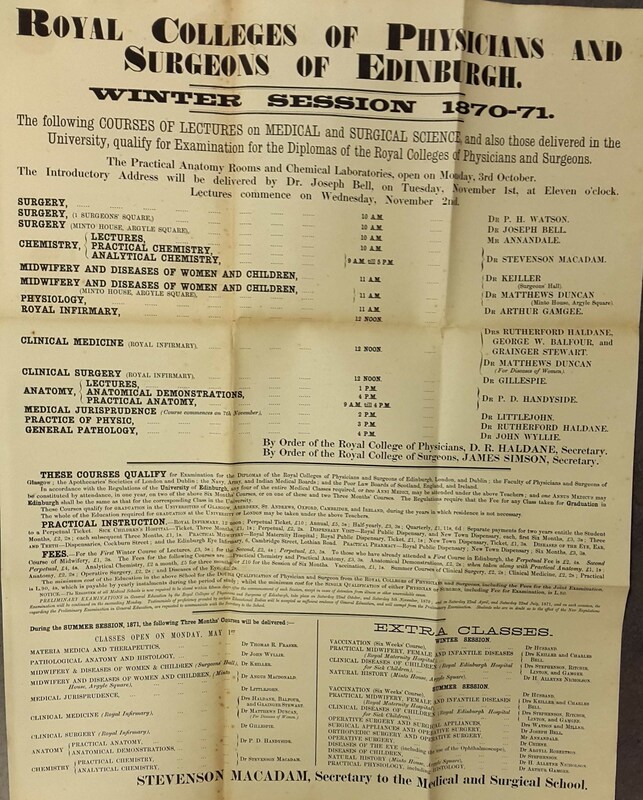 Some material in the collection relates to the earlier period of nineteenth century extramural teaching before the School of Medicine was initiated, including Minutes of the Association of Lecturers, Register of Lecturers and large posters of the medical education marketplace of Edinburgh. There is also existing material covering the period after the closure of the School. Much of the archive was in poor physical condition, and preservation measures are presently being undertaken in order to ensure its longevity. * Please note some material may be restricted access in accordance with the Data Protection Act. Further reading: Douglas Guthrie, Extramural Medical Education in Edinburgh and the School of Medicine of the Royal Colleges (E & S Livingstone, Edinburgh and London, 1965). Helen Dingwall, ‘The Triple Qualification examination of the Scottish medical and surgical colleges, 1884-1993’, Journal of the Royal College of Physicians of Edinburgh, Vol. 40 (Sep 2010). Matthew H. Kaufman, Medical Teaching in Edinburgh during the 18th and 19th centuries (Royal College of Surgeons of Edinburgh, 2003).